Update (May 15, 2012): Just a wanted to let you know that the release date for the book has been changed to the beginning of July. I’ll keep you posted should any more changes occur! 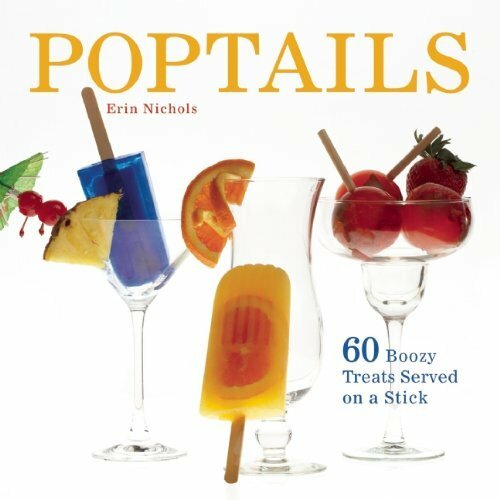 This is just a short note to show you guys the cover of my soon to be released cookbook and let you know that Poptails: 60 Boozy Treats Served on a Stick will be available to buy on June 12. That’s 54 days away in case you were trying to count it out in your head. I can’t wait to infuse your summer with Manhattan and Dirty Martini pops and I look forward to hearing all about the shenanigans you get into while passing them around at your lake houses, pool parties, and backyard barbecues. Cheers! I’m SO excited for you, Erin! I already have at least 3 people that I want to buy this book for…. what a perfect housewarming gift.. 21st birthday gift… and maybe even mother’s day gift for all us moms that are just trying to get through the idea of kids home all day during the summer???? at any rate– I’m utterly THRILLED for you!!! xxoo!! Wait a second. How did I not know that you were working on this? So many congratulations! I’d be happy to do a blog post about it when it’s out if you’d like. ERIN!! So thrilled to see this. Yay you! Well aren’t you sneaky – way to go! And what a delicious cover. Congrats! I am so proud of you! I can’t wait to see it. I want to know what’s in the BLUE one? And a dirty martini popsicle! omg!!!! Congrats! I love the look of the cover – the white is so minimalist and the pops themselves look so whimsical. Who doesn’t love cocktails turned into icey treats!